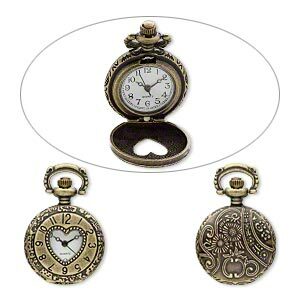 Watch face, antique brass-plated "pewter" (zinc-based alloy), white and black, 41x27mm pocket watch with numbers / heart-shaped window / flower and swirl design. Sold individually. Item Number: H20-A3439FN Have a question about this item? 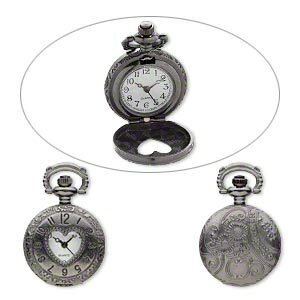 Create watch designs that sell with this pocket watch-style component made of "pewter" (zinc-based alloy). Component's front design displays clock numbers around an open heart window, while the back design shows flowers and swirls. Face opens by pressing top button. "Pewter" (zinc-based alloy) allows for the creation of complex shapes with great detail. Watch component includes Japanese movement. Complete with a plastic safety which keeps them still in transit; simply remove the safety and set the watch. Each component is machine-cast, then polished and given an attractive antique brass plating. Watch face, antique silver-plated "pewter" (zinc-based alloy), white and black, 41x27mm pocket watch with numbers / heart-shaped window / flower and swirl design. Sold individually. 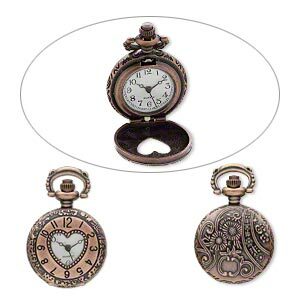 Watch face, antique copper-plated "pewter" (zinc-based alloy), white and black, 41x27mm pocket watch with numbers / heart-shaped window / flower and swirl design. Sold individually. 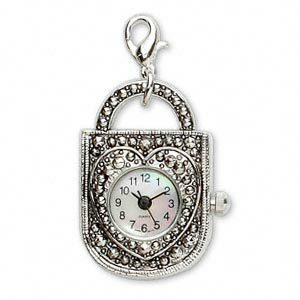 Watch face, gunmetal-plated "pewter" (zinc-based alloy), white and black, 41x27mm pocket watch with numbers / heart-shaped window / flower and swirl design. Sold individually. Watch face, stainless steel and antique brass-plated "pewter" (zinc-based alloy), white and black, 50x25mm single-sided skeleton key. Sold individually. 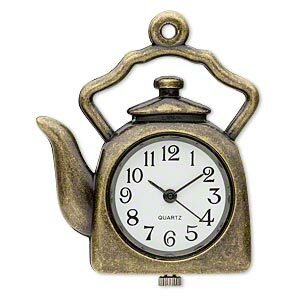 Watch face, stainless steel and antique brass-plated "pewter" (zinc-based alloy), white and black, 34x34mm single-sided tea kettle. Sold individually. 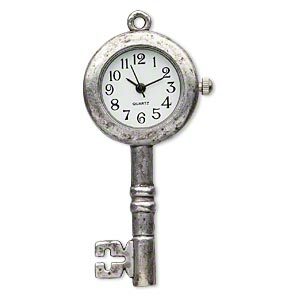 Watch face, stainless steel and antique silver-plated "pewter" (zinc-based alloy), white and black, 50x25mm single-sided skeleton key. Sold individually. Watch face, stainless steel and gunmetal-plated "pewter" (zinc-based alloy), white and black, 50x25mm single-sided skeleton key. Sold individually. 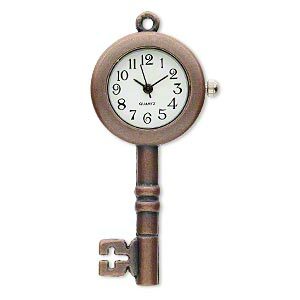 Watch face, stainless steel and antique copper-plated "pewter" (zinc-based alloy), white and black, 50x25mm single-sided skeleton key. Sold individually. 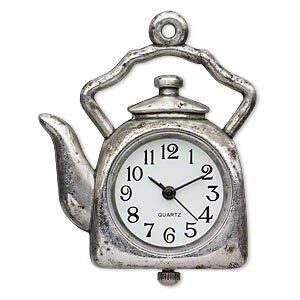 Watch face, stainless steel and antique silver-plated "pewter" (zinc-based alloy), white and black, 34x34mm single-sided tea kettle. Sold individually. Watch face, marcasite / mother-of-pearl shell (natural) / antique silver-plated "pewter" (zinc-based alloy), white and black, 29x19mm. Sold individually.